I recently upgraded my dust collector to a Clear Vue CV1800 cyclone dust collector. If you haven’t already seen that video and article be sure to check it out. The upgrade was something I’ve wanted to do for a long time and I’m glad I finally got that behind me. But in order to take full advantage of the more powerful system the old piping needed to be replaced. Running nothing but 4” for the new system would drastically cut down on air flow and basically starve the system. Long before I got the collector I did a lot of research on piping and what to use and what to stay away from. I read a lot of Bill Pentz’s research on the topic. If you’re looking to make dust collection changes to your space I recommend that you stop by his website and soak up as much as you can. 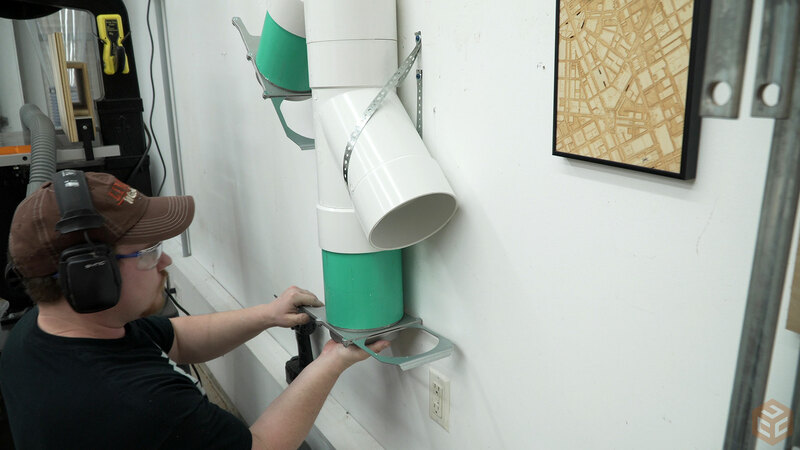 I decide to use 6” PVC for as much of the system as I could and hope to keep a constant 6” diameter of air flowing through the system at all times. 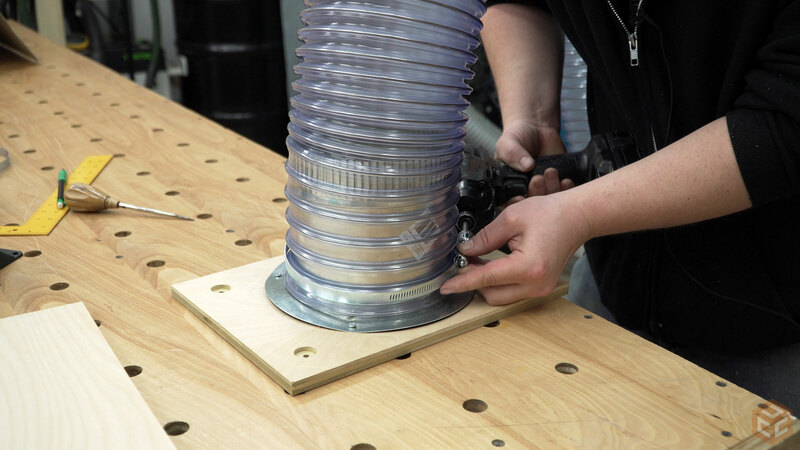 After showing PVC dust collection pictures on social media the same common misconception was stated over and over; Static electricity from using PVC piping can cause a dust explosion in your dust collection system. FALSE. If you are interested in reading details on why this is a myth feel free to check out these two great articles on the topic: article 1 and article 2. Lee Valley Tools 6″ blast gates. I bought 5 for $97. SDR35 pipe and fittings. I paid $422.55 for my order but I have about $100 extra stuff to return. I bought extra as I wasn’t 100% sure on a change I could have made to the layout. Used 55 gallon hazmat barrel. I paid $63. This might end up being a bad deal as its quite rusty inside. I had trouble getting it to seal at first. It’s used so I can’t take it back. I might have to get a new barrel. A new one with a lever locking lid online is a little under $200 with shipping included. I’ll shop around a bit first. The Clear Vue CV1800 cyclone bundle is $2,045 + shipping at the time of this article (02-2017). 6″ flex hose. I ordered 25′ from Wynn Environmental for $121.92 including shipping. I think I had a dumb moment when I ordered it because I didn’t need that much. I made the mistake of ordering 25′ instead of 10′. I only used 7′ or so of the hose. I guess I’ll hold on to the rest for use later if I expand the system. 6″ to dual 4″ adapters. I ordered two for $90 including shipping. 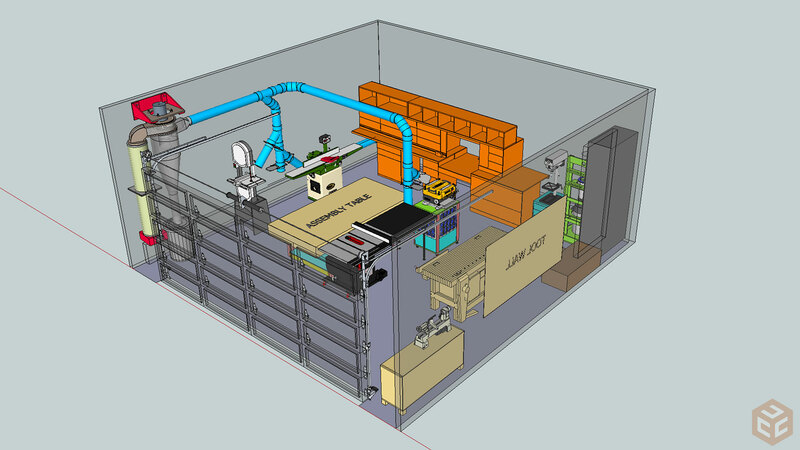 With my materials in mind I took to SketchUp to more easily move the tools around and find a layout that would work with the new dust collection system as well as maintain a good workflow and organization in the shop. 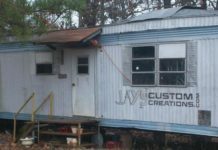 The miter saw station, workbench, assembly table, cyclone cart, air cleaner cart, and lathe cart were imported from previous SketchUp models I created. 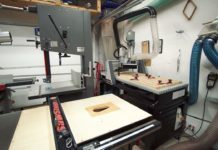 The table saw, planer, jointer, bandsaw, drill press with cart, CV1800 dust collector, and garage door were all imported from the SketchUp 3d Warehouse. Some of the items are not the perfect size for my tools though. So for the jointer I found one that was close to looking like mine then use the S for scale command to scale it to the overall dimensions of my jointer. Same for the drill press cart. Doing this will save you a ton of time modeling your shop tools and will also allow you to get a very accurate representation of your space for you to manipulate without breaking a sweat. The planning was done, the collector was installed, and all of my supplies were delivered. Time to get busy. The majority of my pipe cuts were made with 3 cuts at the miter saw. 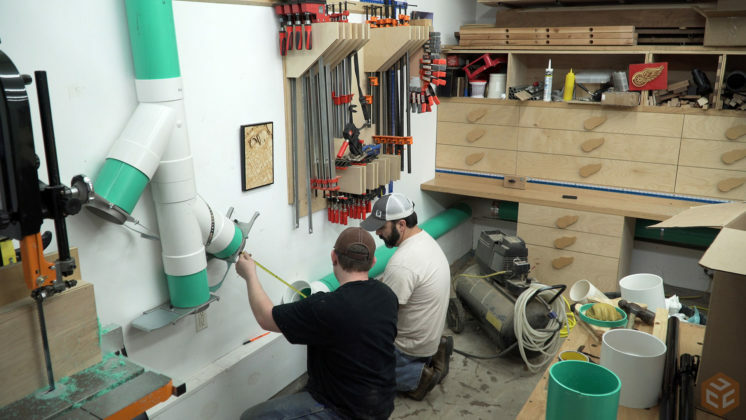 The dedicated work surface and stop block setup of my miter saw station really helped out with handling the large sections of pipe. This was the first time I’ve seen pipe come in 14′ lengths. One of the things I like the most about this miter saw station is the ability to process long lengths of stock with ease. Normally it’s 12′ rough sawn hard woods or something similar but in this case it handled the pipe with ease. To reduce turbulence in the collector it is recommended that you start the piping out of the cyclone with a 5′ section of straight pipe with no fittings. So that’s what I did. You can see here that the intake angle of the cyclone isn’t horizontal. It’s at a slight angle to aid in collecting the dust in the bin below the cyclone. 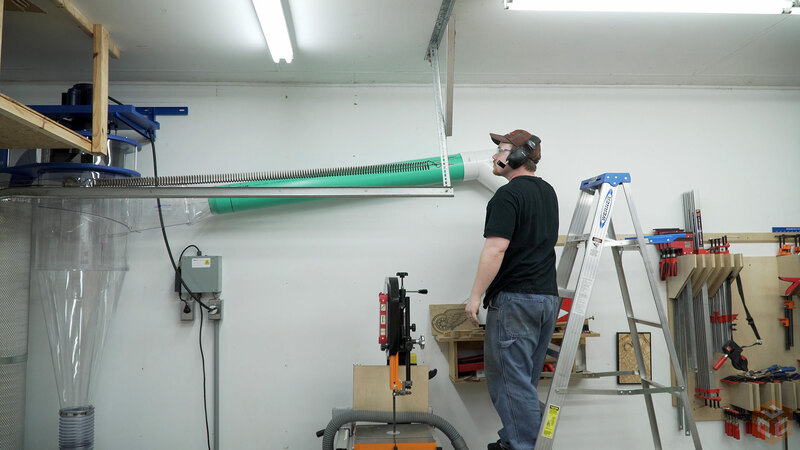 The location of the cyclone and the length of the first pipe needed worked out really well to clear the garage door rails in my garage….I mean… It’s a shop. Work smarter, not harder. Any time you have the opportunity to assemble on the ground or on a work surface always take advantage of that instead of trying to assemble in the air. To mount the pipe I used perforated metal strapping. It’s not an elegant solution but it gets the job done and is inexpensive. Just make sure you mount everything to a wall stud for support. The blast gates I’m using are the 6” aluminum self-cleaning gates from Lee Valley. Again, recommended by Bill Pentz. I previously made my own 4” blast gates for the last system I had. In this case I had no desire to make my own gates. I want to get up and running so I can work on projects. The blast gates fit snugly inside the pipe and are sealed with a bead of silicone. It’s best to put the blast gates closest to the main line as possible so you don’t have a long section of pipe pressurized that isn’t even being used. The most notable example of this is the blast gate for the miter saw station which I’ll get to shortly. My friend Shawn from Stone and Sons Workshop offered to lend a hand with the piping so I took him up on his offer. Having an extra set of hands as well as an extra 8′ ladder made things go smoothly. We started with the branch going to the middle island. The bottom of the pipe ended up being about 8-1/2 feet off of the ground so there is very little risk of me hitting it when moving lumber around in the shop. My garage door opener is lower than that. 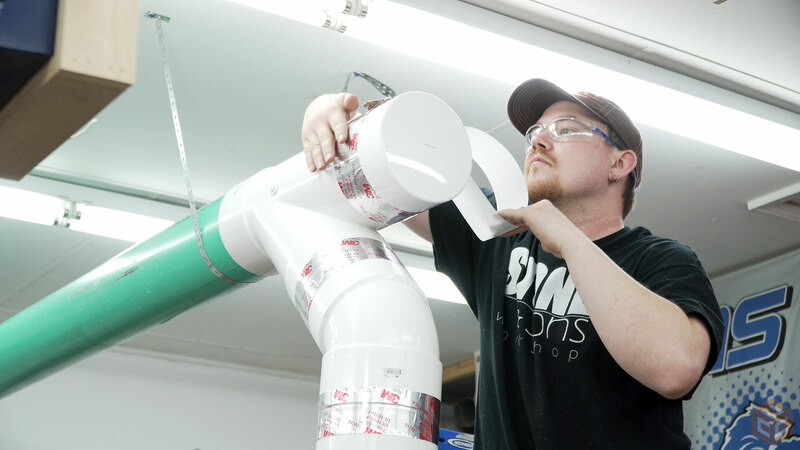 Shawn had the idea of using a wye fitting that terminates to a cap to allow for easy expansion later. It was a simple thought that makes a lot of sense and something that just never crossed my mind. I was planning on going straight down to the tools without thinking of future expansion. It’s proof that two minds are most often better than one. With the center branch done we focused on the miter saw station. Because my miter saw is so darn long in the front to back direction I made the original dust collection come up from below. There was no room for me to drop the larger pipe in from above so we went the same route with running the pipe to it. 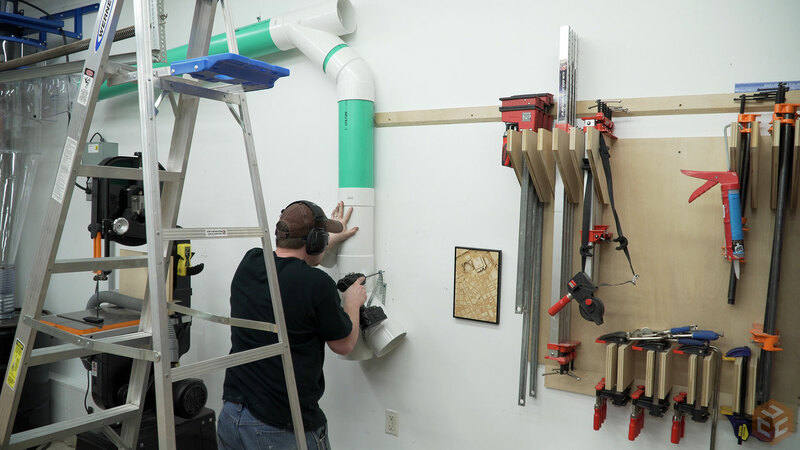 You can see here that the blast gate near my left hand will terminate suction to about 20′ of pipe when the miter saw station is not being used. If the blast gate was located right at the miter saw station port then there would be unnecessary energy loss on that section of pipe at all times even when it wasn’t used. 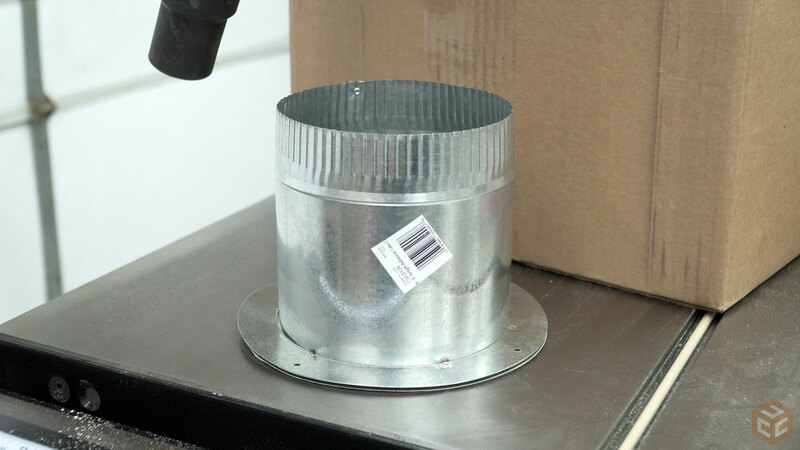 Standard 6” plastic dust collection ports are nearly impossible to find. So I had to make my own. I found that the least expensive route for me was to get a couple of these 6” HVAC Take Off fittings. 6” hose fits snugly over the top of them and they have an adhesive gasket material on the bottom. I got them from my local Lowes for $5.99 each. 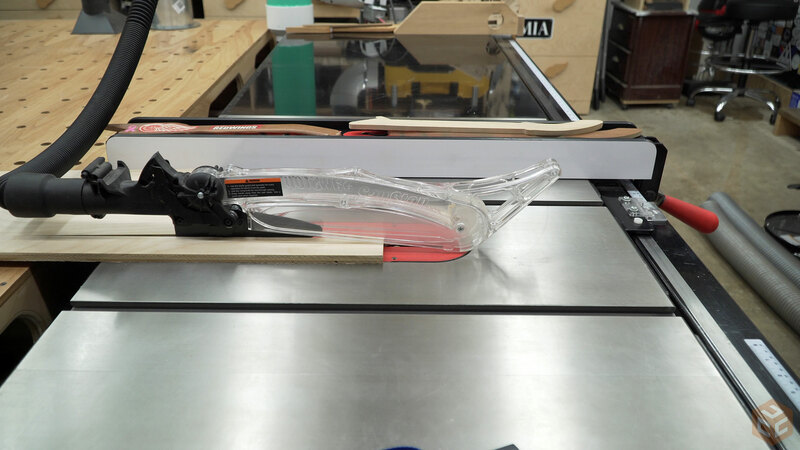 To make the miter saw port I reduced the height of the take off with a jigsaw and attached it to the 4” opening with the adhesive gasket and four screws. The hose was clamped to it and you can’t see it in the picture but I used a heat gun to stretch the hose over the pipe coming in. Behind the miter saw I used a router and a flush trim bit to enlarge the 4” opening to the 6” port. This was the part of the entire install I was dreading as I didn’t want to remove the miter saw and lose calibration. But it ended up being really easy and didn’t take long at all. At this point I had most of the tools hooked up. I figured it would be a good opportunity to test the dust collection on a few tools while I make the port for the jointer. I made a 24” rip cut on the table saw and was very pleased with the results. I had a tiny bit of dust shoot through on the exit of the cut. The over-arm dust collection on this saw is pretty awesome but you normally always get a bit of dust spraying out as you complete the cut and the blade passes through the back side of the material. The ending dust spray was reduced quite a bit. 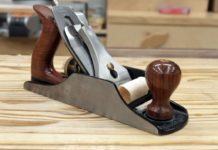 The cut at the table saw and miter saw were to make this jointer port. Just a piece of 1/2” plywood with another 6” Take Off installed. I didn’t reduce the height of the take off as it didn’t matter in this application. And here you can see it installed on the jointer. The blast gates work perfectly with the pipe I was using. But due to the slight taper they have clamping a hose to it is a little inconsistent. To help hold the pipe in place and prevent the hose clamp from sliding the pipe off I used a small strip of double-sided tape on the blast gate before installing the hose. This worked great. Time will tell if it continues to hold or if I’ll have to put a 2” section of pipe in between. 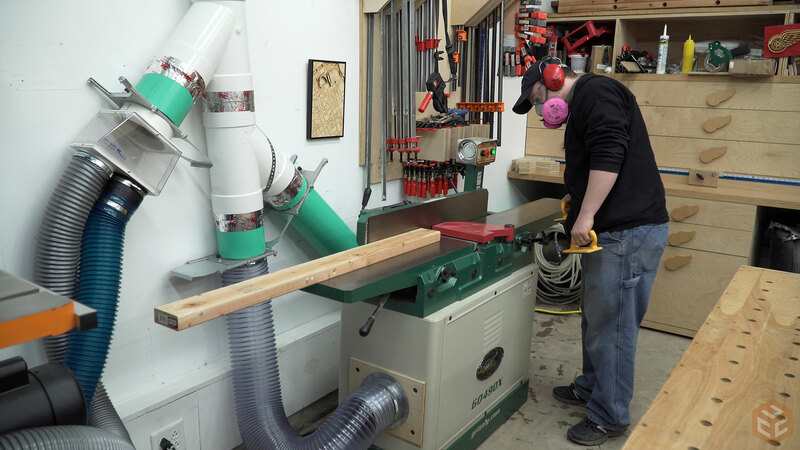 A pass over the jointer shows the dust collection working great. I also made a couple passes with the planer. It works great as well except for a little bit of large debris being thrown out the front. That’s an issue with this planer and not the dust collection though. This planer has a fan powered chip ejection on the back which does a good job by itself but it’s always had this issue of throwing a few chunks forward at the end of the cut. You’ll notice an open 4” port next to the planer connection on the pipe. This is because I didn’t want to restrict the system down to a single 4” line for the planer. 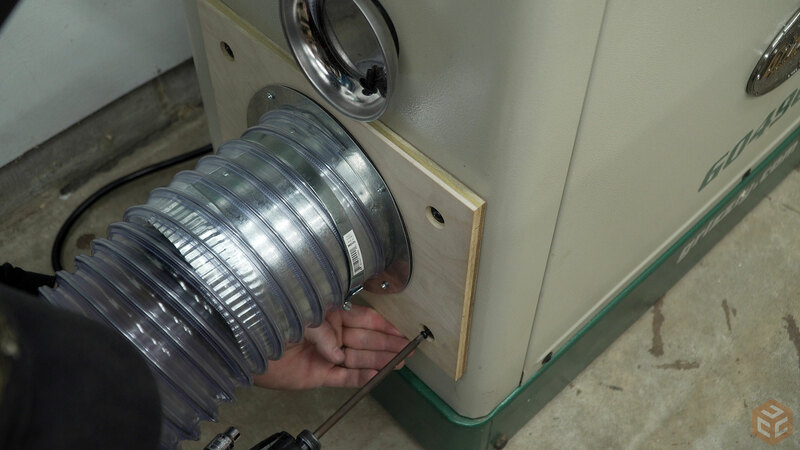 Leaving it open allows the collector to work efficiently by keeping the airflow up. I didn’t notice anything trying to escape while the system was running. Lets do an overview on the system. I have a 5′ section of pipe coming out of the collector to reduce turbulence in the collector. Followed by a wye fitting that goes down to the perimeter branch. The first wye fitting goes to the bandsaw where I immediately have a 6” blast gate followed by a true 6” to dual 4” adapter. The gray hose goes to the factory port on my bandsaw. For now this gets me up and running but that port doesn’t do a good job on this saw. In the near future I’ll make a custom under the table shroud to collect the dust immediately as it passes through the table. The blue hose is a Rockler Dust Right hose that expands to 28 feet so I can clean my entire shop with it. Behind the saw I have a few of the Dust Right cleaning attachments which are great. 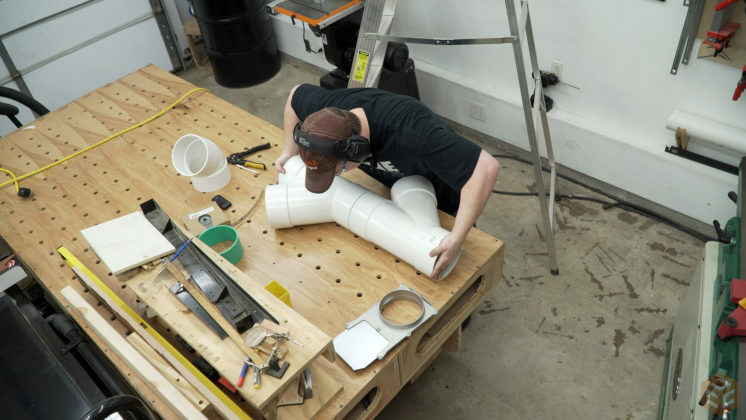 I wanted this hose here because I also wanted to make a top-down arm for dust collection at the bandsaw. This gives me another hose to plug into that. Below the bandsaw wye fitting is another wye fitting going to the miter saw station. On each side of that wye fitting are the blast gates for the miter saw station and the jointer. On the top side of the first wye fitting in the system is the branch going to the center island. At the top of the island drop is a wye fitting with a cap on top for future expansion. Then a wye fitting for the planer. The planer has a 6” blast gate followed by another true 6” to dual 4” adapter and only one port being used for the planer. That planer has a fan powered chip ejection which works great. The open port on the 6” to dual 4” adapter is for future expansion if needed but I’ll leave it open in the mean time to prevent starving the system of air. Down from the planer connections is another 6” blast gate for the table saw followed by a 6” wye with a 4” piece coming off of it. This is the only part of the system where I have some concerns. A 6” diameter is roughly the same as two 4” diameters. I have one 4” pipe going down to the factory port on the table saw. The other 4” section is for the over-arm collection that I’m reducing quite a bit. Where the black flex hose connects to the pipe is a lose fit held in place with two screws so there is some air flow gained around that hose but the restriction is still there. I’ll be paying close attention to how this setup performs. If it works out with no issues after some use I might just leave it alone. If some issues pop up because of it I’ll have to figure out something different to utilize a full 4” of suction over the top of the table saw blade. Time will tell. Maybe this isn’t my business, but would you be willing to share how much this entire set up cost? I need to invest in a better dust collection system (I just had sinus surgery as well), but have always dreaded the cost. Hey Joe. I added a list near the beginning of the article. Do you mind sharing where you purchased the 6 inch flex hose from? I have been in search of some that work with the 6 inch takeoffs and the first one I purchased didn’t fit. Hey Kendrick. I added a list near the beginning of the article. Great info! 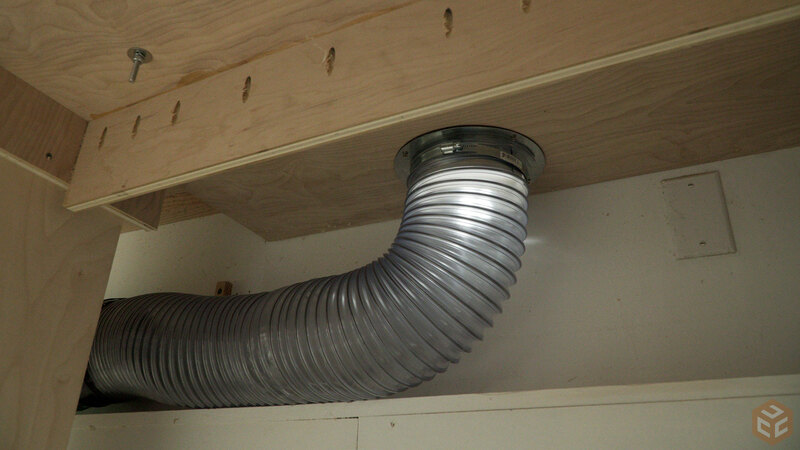 Thanks Jay, you’ve given me ideas for better dust collection in my shop. 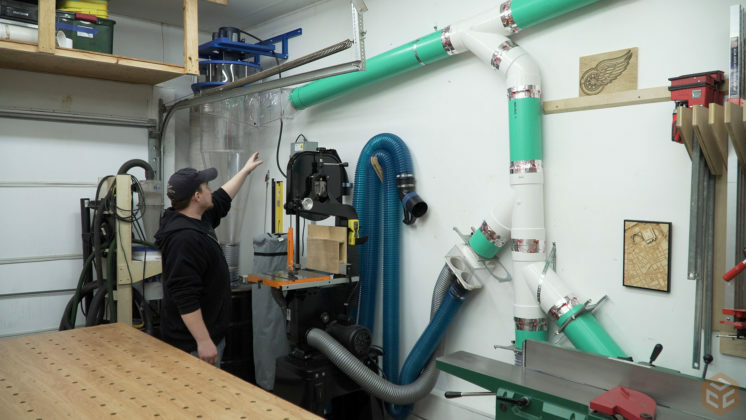 Check out Rob Cosman’s video on dust collection at the bandsaw. You might find it useful in getting better collection for your bandsaw. I’ve seen it. It’s a great setup for that saw. But there isn’t enough room to to do the same on mine. I’ll do something similar though. Thanks! I have a very similar plan for my own garage (err I mean shop). Except I was thinking of having a couple of outlets terminating at ground level as a sweeper port. Do you think it would be benificial? Or is it a little redundant if you have the blue expansion hose. Great job btw. Your videos and blog posts are always my go to when researching new ideas. Redundant for me as I have the blue expansion hose. I had a floor sweep in my last shop and I loved it. Couldn’t you just get a Roomba? Last time I used the 55 gallon Roomba model I kept tripping over it. .
Wow, I am impressed. I am still using my HF system, which seems adequate for now, but changes are coming for it. I hate emptying the bag, and want it to go directly to a drum on rollers. 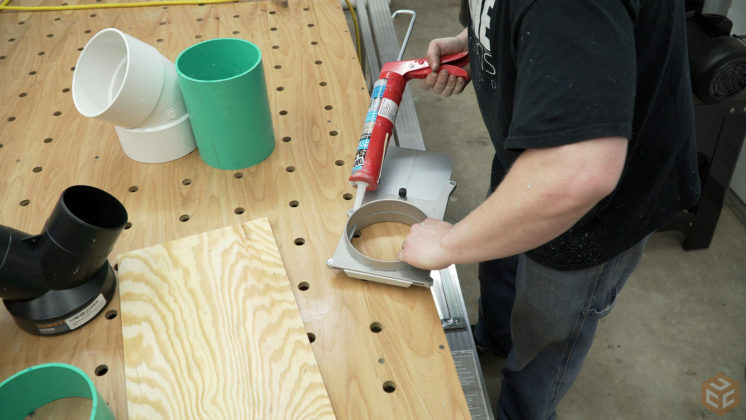 I love the idea you used, as well as the one you shared, for making the miter saw station more dust free. That is the worst tool in the shop to date for collection. 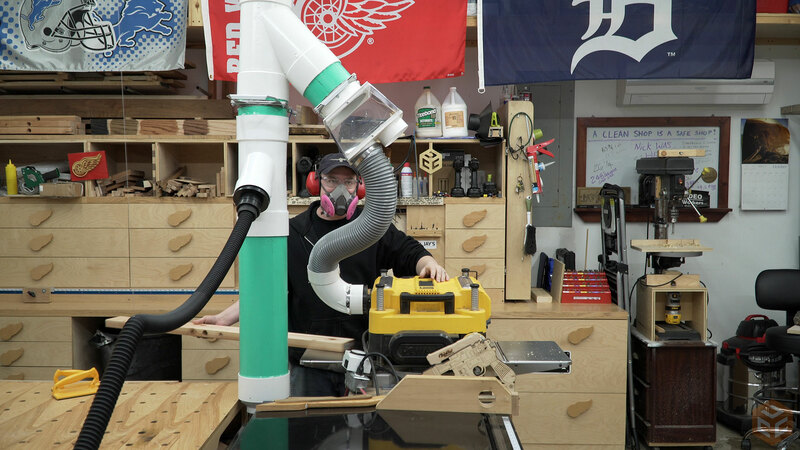 I will post videos on R&D WoodShop on YouTube of any upgrades I make to my present system. Kudos. I can’t afford your route yet, but hope in the future things change. Thanks for the excellent article and the background information. When I was in college, I worked summers at a plant that made cornstarch. They were very picky about dust safety, much as grain elevator operators are. I think they were operating in a high speed high air volume environment that was mentioned in one of the reference articles. We wore boots with no exposed steel nails, used aluminum shovels, and kept the place very clean. The plant is closed now, but never had an explosion in its 30 plus years of operation. I think the only fatal accident happened during the plant’s construction, when a worker fell 3 stories. I hope that all the care you have taken with this dust system pays off in improved respiratory health for you. Will the HF dust collector work OK with the 6″ pipe? I have several pieces of the 6″ pipe that I’d like to use if the Harbor Freight collector will work OK with it. I’m not sure but I’ve seen some other people use 6″ for the main trunk and drop to 4 for the tool runs. I’ve also seen people open up the intake port on the collector motor to about 5″ to increase air flow through the impeller. I saw a great idea somewhere recently for the blast gates. Take that little set screw out that holds gate in X position. You can buy small cylindrical earth magnets that will slide right into that same threaded port to hold the metal gate open or closed. The guy may have used an epoxy, or drilled the threads out, don’t recall. You’re smart, you’ll figure it out. Good Job, been waiting for this video. Great layout, thanks for sharing the process. It looks like a serious upgrade. I’m still rocking a modified HF dust collector in my garage shop but I’m hoping to build a 30’x30′ dedicated shop in the next year and this is definitely my dream setup for that. 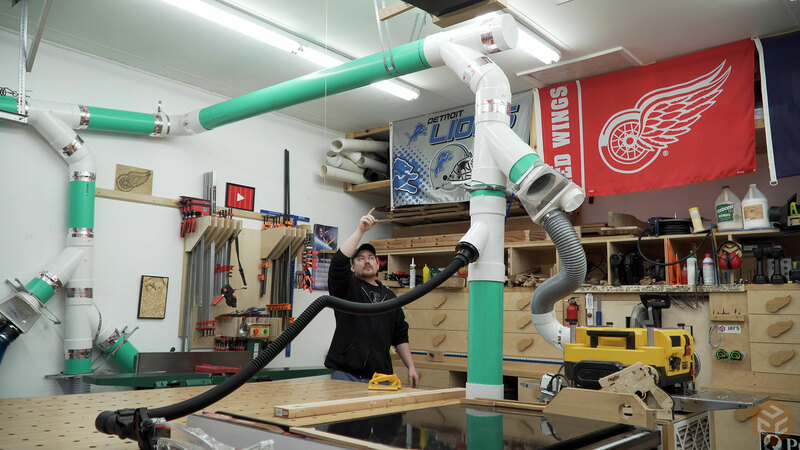 When you showed how you remove the overarm dust hose on your table saw I had an idea. If you decide to keep that hose maybe mount a self-retracting pulley on the ceiling with a stopper. That way you can unhook the hose and it will pull up to a reachable height but still out of the way. You should make the blast gate automated to a second remote. Amazing set up though. That would be nice. But at this time not worth the effort in my opinion. That is one big industrial dust collection system. Not very practical for the average wood worker working in his garage or basement. Sounds like it will require ear protection also. But sure it will be help full for some one with your sinus problems. I see in this video that you were wearing a respirator also. Great job and thanks all of the info. Like yourself, many of us want/dream of upgrading our DC systems and it is really helpful seeing what can be done AND examples of cost. hi Jay, the following is a post on another guys site. He was building a box for his dust collection for his chopsaw. Just thought I would share my opinion. PS… to turn on and off my system I have the old fashioned “clothesline” running the length of the shop. It operates a standard single throw double pole switch for my 220 volt collector. I like the old fashion feel of it. However I have a problem forgetting to close a gate when I start another machine. Iam going to setup my gates with a switch “normally open” so when I open a gate it will operate a relay to start the system. If I leave the gate open, the collector will stay running. Would you take us through debris entering the collector, vortex separation, chunks cleanout, dust storage and cleanout? 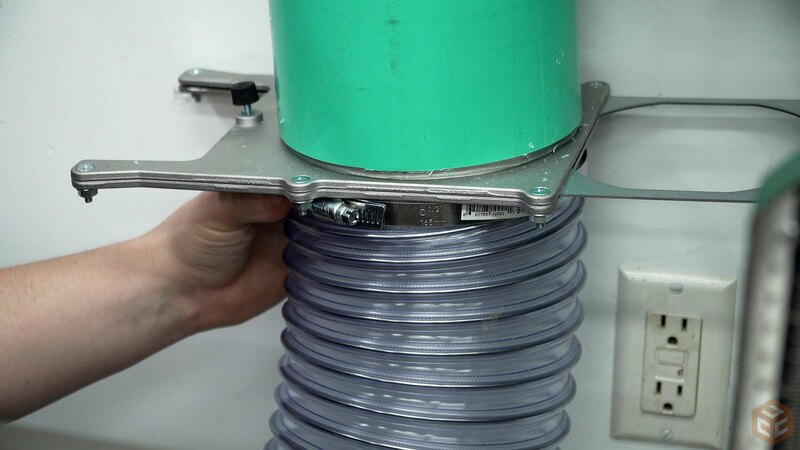 Are you going to run a grounding wire on your plastic piping? Excellent article and video. Thank you very much, I really appreciate all the hard work and helpful information!!! Two questions if I may, would you mind including a picture of the actual connection to your table saw. I have the same saw and I’m working on setting up my dust collection and it would be super helpful to see what you did there. Or if you already included the picture and I just missed it let me know where to find it please. The other question is, other then where you have tape or specifically mention sealing with silicone are the pipe connections just pressure fit or did you glue/silicone each connection as well? Thanks again very much for this and all the great content! Hey Toby. 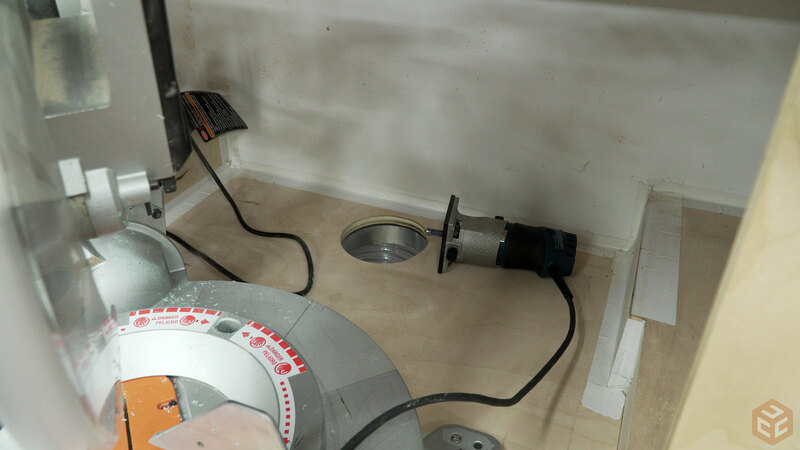 Immediately out of the back of the table saw is a Rockler Dust Right 90 degree elbow going to a 4″ pipe to the drop. I had to put the 90 there as my assembly table fits directly to the back of the saw and I had no room for a run of straight pipe out the back. Every joint is siliconed or taped. Thank you very much Jay, I really appreciate it! Also you didn’t say if you got ur 6″ PVC at Lowes or H.D. and if it was purchased locally or online? I live in Las Vegas and 6″ PVC is no where to be found locally. As far as I’m aware at least. Lumber rack is on top of the miter saw station. I got my PVC from a local plumbing supply store. Try asking at both L & HD if they’ll order the pipe you need. A little excess is not bad if a minimum order is required. Your mock-up looked a little low to work with. would it work better mounted higher with a 90 bend and a drop down? Love the shop illustration, seem’s I’ve missed some changes lately. Your system is better than some commercial shops I have seen. Have you checked the noise levels? One shop in our town has the dust cyclone , etc., outdoors, which I was told is common due the racket from large impellers/motors. It makes disposal easier there, too. 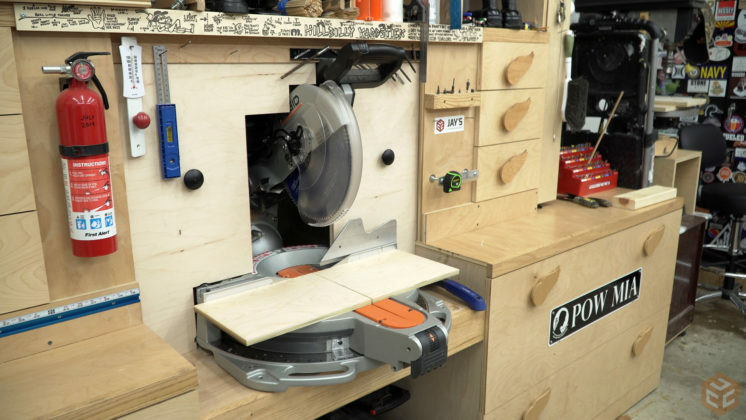 I don’t get leaving one of the 4″ ports open when you hooked up to the planer? Couldn’t you have used a 6 to 4 inch tapered adapter?? As stated in the second paragraph, to keep a constant 5″ diameter of air flowing through the system at all times. Two 4″ ports are close to the same diameter as one 6″. 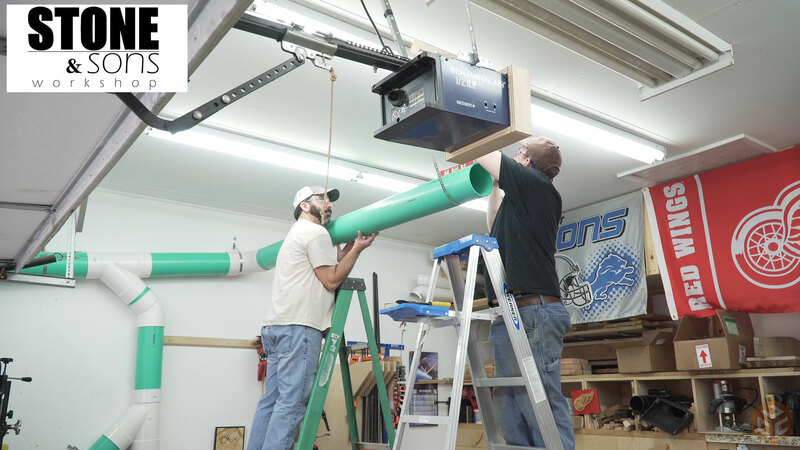 The system needs two open to keep enough airflow going to keep the vertical runs clear.